Shulk, Reyn, Sharla, Dunban, Dickson, Otharon and Juju followed Kacha as he led them through the doorway behind the throne in Exile Fortress. He took them up a ramp, winding around the side of the building, until they found themselves back on to flat ground. Grass grew atop the roof of the fortress, in the middle of which sat a dark-coloured altar. Kacha led the party to it and turned to Shulk. “Hom hom put mirror here!” he ordered. Shulk obliged, laying the giants’ mirror on top of the altar. The mirror glowed faintly, its light spreading across the altar. The two then went dim, and the altar opened up to reveal its contents. Inside was a large orange orb, twice as big as Shulk’s head. Reyn reached into the altar, placing his hands beneath it. The rest of the party followed her eyes and immediately pulled out their own weapons. “There are three of them!” shouted Dunban. The party were surrounded by giant arachno. They reminded Shulk and Reyn very much of the one they had encountered at the end of Tephra Cave, just before they came out on to the Bionis’ Leg. They were held up by four purple legs, each tipped with yellow claws. Four chelicerae protruded out of the sides of their tiny faces, with two on either side. Giant black ear-like structures stuck out of the tops of their heads, sporting striking red veins running through them from top to bottom. Out either side of their black abdomens grew an oval-shaped purple structure, from which three spikes poked out of the side. The top of the oval-shaped masses were black, with red dots spotted throughout. “What if they follow us?” shouted Juju, panicked. One of the arachno, tired of their conversation, fired a shot of web at the party. They dived to get out of the way; it stuck over the top of the altar. “MOVE!” Dunban roared. He ushered Juju and the rest of the group back towards the ramp they had come up from, fending off the arachno with the help of Shulk and Dickson. “Here, kid,” growled Reyn, pushing the orb into Juju’s hands. “Don’t drop it. We’ll follow ya. Get the orb and Kacha outta here!” He leapt into the fray alongside his friends, with Sharla and Otharon providing covering fire. They slowly made their way across the roof of the Exile Fortress, creeping ever closer to the road leading downwards. Juju and Kacha stayed close to Sharla and Otharon, not daring to stray from their protectors. As he spoke, one of Sharla’s rifle bullets blasted off the chelicerae of one of the arachno, which Shulk was fighting. The beast shrieked, and he used the distraction to plunge the Monado into its face. It gave a shudder, before collapsing before him. The other two arachno turned on Shulk, snapping their jaws. One of them lunged at him; he waved the Monado in response and a yellow shield appeared around him. The arachno stopped mid-air when it hit the shield with a sickening crunch. Dickson leapt on the beast and pushed his rifle into its abdomen. He fired a bullet, sending arachno guts spraying across the roof of the fortress. Sharla and Otharon trained their rifles on the final remaining beast, which attempted to flee. The arachno shrieked and reared up, preparing to slam its fangs into Reyn. Shulk was reminded of the scene in Tephra Cave. It feels so long ago. Dunban stepped up to the beast and executed a horizontal slice, cutting his foe in two with his katana. It fell to the ground. Sharla sighed. “Let me take a look.” She held out Reyn’s arm and examined the wound. “It doesn’t look too serious. Let me patch it up though. It’ll heal faster this way.” Sharla reached into her bag and began tending to Reyn’s wound. “That was amazing!” exclaimed Kacha, causing everyone to jump; they had all forgotten he was there. “We’re merely doing our duty,” Dunban replied. “So what is that orb?” Shulk asked, turning to look at the object in Juju’s hands. “So what’re we going to do with it?” Reyn asked. “Hom hom leave Daring of Giants with Kacha if they not want it,” Kacha suggested hopefully. “First, we need to get you back to camp,” Dunban said to Kacha. The Nopon was ecstatic with his find as he and the others headed back down the ramp leading down the side of the fortress, back through the throne room, around the path leading all the way around the fortress and came out to ground level. 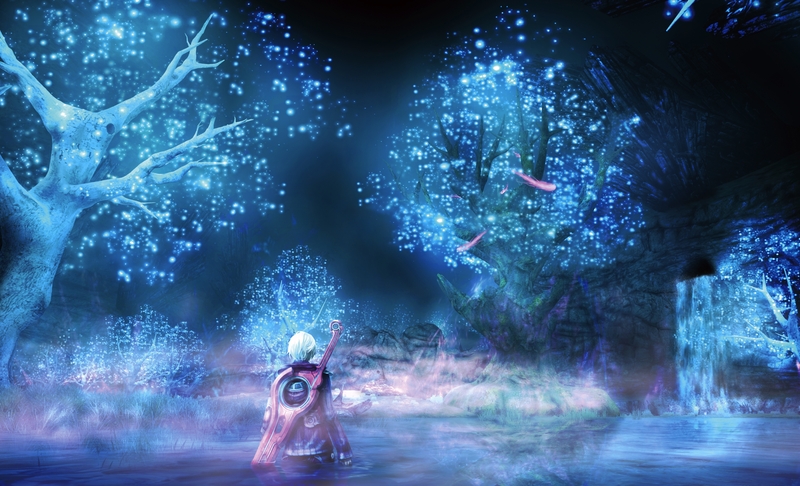 The party struck north-west, heading back towards the Nopon camp. The sun began its descent in the sky as they walked. They headed past the Silent Obelisk, around the Barren Moor and the Poison Swamp, passing the stunning Zaldania Waterfall again. “I still can’t believe how light this thing is,” Juju commented, staring in amazement at the orange ball in his hands. “What other kind of magic could they do?” Juju asked the Nopon. The Nopon camp was in sight, and the sky above was pink. When they arrived, the Nopon in the camp were overjoyed to see their friend again. Kacha beckoned them over. “Look what Kacha find with hom hom friend!” he exclaimed. “That what Kacha looking for?” one of them asked. “If you wouldn’t mind, that would be greatly appreciated,” said Dunban gratefully. The party told the Nopon merchants everything that had transpired on their journey to and from the Exile Fortress; the brogs, the Crown Tree, the secret key and their fight in the throne room; Kacha was embarrassed at this point. They talked of finding the orange orb using the mirror Shulk had chanced upon at the Bionis’ Leg. The Nopon were fascinated, listening intently even as they ate their dinner. “We haven’t defeated all the monsters you’ve asked us to yet, but we will before we leave the marsh,” Dunban assured them. “How’s your arm, Reyn?” Sharla asked him. “I think we all should,” said Dunban.